Skip The Line-A Look at The Inside- Getting out of the lines that form at the Acropolis and Agora in Athens Greece. I cannot say how many times I have walked up the magnificent marble steps of the Acropolis, but even if I went every day of an entire lifetime, it would not be enough. I always have to remind myself that what one can see today is 'only' the bare bones. The columns were painted with mineral based paints and the roof was constructed with wood, covered in ceramic tile. Not to mention the magnificent 40 foot tall golden statue of Athena, shining in the afternoon sun. She could be seen from the port miles away by the returning ships coming back from trade or war excursions. You might not know that there are several other monuments on the sacred rock including the Porch of the Caryatids and the Temple to Athena Nike, a small temple dedicated to Athena the Victor (Nike means victory-or the winner). When cruise ships are docked at port the entrance to the Acropolis gets jammed. So here is how you can beat the lines. Hours are from 8 am to 8 pm -7 days a week. If you get there at 8 a.m.,there will be less people. But anymore the cruise lines are offering early start times so lines can even form early. If you are going anytime during the summer months when it can get hot-and this can include May and September, forget going anytime after 10 a.m. There is only one place to sit out of the sun on the Acropolis (it is one of the highest points of the city), so it can get blazing hot. As a matter of fact they close down the site when the temperature gets too high. My insider time to get there is 5:30-6 p.m. You will have 2 to 2.5 hours and you will have very few people there. The cruise ships have left or everyone is back on board enjoying the buffet. If you really want to make it super easy-get your ticket from the day before-it is good for 4 days. If you get the extended ticket you can use it for 9 other sites (including the Agora) right around the area, which are always less crowded. If you bring a college student I.D. then you can get a reduced-price ticket. If you bring passports for verification, anyone under 18 years old gets in free. Of course you can always go with us and we'll take care of everything. See our Greece trip! Skip The Line-A Look at The Inside- On a recent trip to Italy we were in Rome with guests, in cold and rainy weather. We did not care, as we were off to see the Vatican Museums and the Sistine Chapel. Our guests had no idea what was in store for them as we passed a line several blocks long of around 500 ​people waiting in their rain ponchos. At each checkpoint our guests hesitated as I kept smiling. We stopped at a separate entrance, for people that had a reservation, and were admitted with no waiting. Of course if you want you can always go with us-we do all the work for you! Italy with the Olive Odysseys. Apps That Work- It is tragic-comic to see people traveling with their heads down squinting at their smart phone (or their travel guide) trying to 'get it all in'. Hah! ​​I cannot tell you how many times I have seen people sitting in a cafe under the Acropolis with their head in a guide book or reading their cell phones. I have to hold my hand back from tapping them on the shoulder and encouraging them to look up at the sacred rock-'its right here' I want to say-'the acropolis that is what you came to see'! But there are some useful apps for before your trip. We have recently had some good outcomes with the app CheapOAir. It is not an airline, as one horrified person just recently asked me, but a search engine for cheap flights. The only caveat is that the last three times we booked transatlantic with this app the airlines never got our meal request (Asian vegetarian if we can get it). Not to worry, we really try to abstain from eating the airline food and take the perfect food with us-thatcoming up in another post! They also just announced they give discounts to military personnel on flights to and from Europe. How to Get The PDF- Try this one on how to book hotel rooms. This we found out while riding the elevator in our hotel in Rome. It was from the Hoteliers Association of Italy directly to the customers. A game changer for the on-line booking sites, but great for you. You can use this in any hotel you wish to book in Europe. Email us if you try it elsewhere and it works for you! 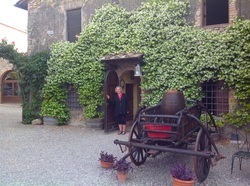 We were recently at the farm in Tuscany to visit with Frederika and Umberto. The hospitality that these two, along with their daughters and staff offer, is above and beyond. Definitely one of the highlights of the trip. Frederika not only opened up her kitchen to us, but shared her recipe of Tiramisu with us. She made it easy for us to portion it out, so that you can make it for 2 or 20. She kept calling it 'stupid Tiramisu', because according to her it is 'stupidly simple' Here is is-thank you Frederika. Our new book- Travel Like You Mean It! ​Patricia Hajifotiou (Owner of The Olive Odysseys) delivers a distinctly different book on the subject of travel. Insider tips along with funny stories, mostly at the authors expense, are interspersed with 'pinch yourself moments'. Leading tours abroad for 18 years, Patricia relates her adventures from a tour leaders' point of view. Hilarious travel fails plus the #1 way she has learned to make your next trip the best it can be. Download it free below. With a few taps your eBook will be on its way to you. Our gift to you. I have converted the grams to ounces and based the measurements on what you can find in American grocery and specialty stores. The following makes a portion for 4 people to have a serving. Double, triple or quadruple the recipe depending on the amount of people you are serving or how many seconds you want. 1 -8 oz (226g) of Marscapone (sorry no substitutes-find it in the dairy case or near the cheese-best to ask instead of searching for it). 1 -package of Ladyfingers cookies or they are also called Savoiardi-most better grocery stores will have these or Italian specialty store are sure to have them. You will need 2 packages if you decide to double or triple the recipe. 1- cup of espresso coffee the darker the better. Optional-Liquer such as Maraschino/ Gran Marnier / Vin Santo/ even Rum if you like. Divide your eggs. Split the sugar between the bowl with the egg whites and the bowl with the egg yolks. Beat the egg yolks with the sugar until light and fluffy. Then beat the egg whites with the rest of the sugar until stiff. You can do the above with a mixer-either hand held or countertop. But from here on out you need to do this by hand. Mix the egg yolk mixture and the marscapone lightly by hand. Then add the egg whites and mix lightly by hand until just incorporated, do not over do it! On the top of your already 'coffee-ed' ladyfingers you can dribble any of the liquers that you choose. A good way is to 'rain' the liquor on top of the cookies as they are laying in the bottom of the glass dish with your fingers. Then spoon out 1/2 of the marscapone mixture onto the cookies. On top of that place another layer of the ladysfingers that you have already dipped in the coffee and sprinkle any liquer on top of that that. Finish with the rest of the marscapone mix. Finish the Tiramisu with a generous sprinkling of pure Cocoa. The Tiramisu improves by at least an 8 hour sleep in the fridge. If you can leave it alone for all that time!